Perfect for: Inexperienced growers who give priority to the taste and aroma over the yield. 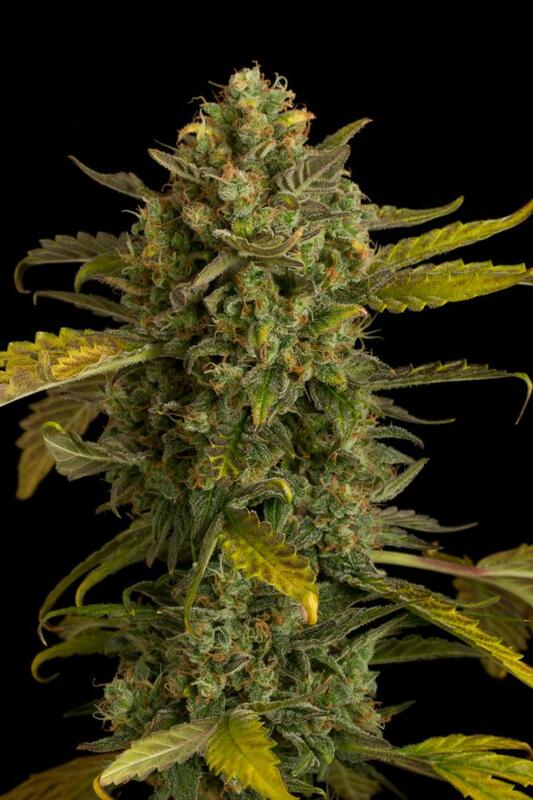 Blue Kush Autoflowering cannabis seeds by Dinafem Seeds are here to delight the senses and boost the organoleptic qualities of cannabis up to a top level. Our breeders developed this strain to bring the exotic smells of Blue Kush to all kinds of audiences. When creating the autoflowering version of the world-renowned Blue Kush, we wanted her to be easier to grow. And the result couldn't have been better: a mid-sized marijuana plant whose colours are pure magic and whose aroma is a marvelous mix of the typical diesel scent of Kush genetics and the fruity smell of the Berry lineage. Pure joy. Blue Kush Autoflowering is a rather small marijuana plant that barely reaches heights of 1.20-1.50 m. This Christmas tree-shaped plant is bushy and compact, with some but not many branches and medium spacing between nodes. We cannot fail to mention that she tends to stretch most during the third week, so don’t get surprised if, after twenty days of growth, she increases her size a lot. 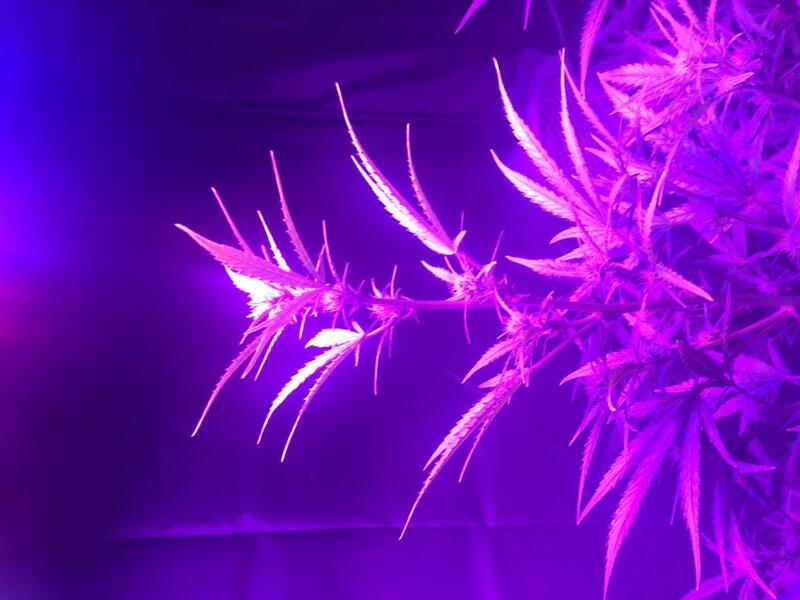 This amazing hybrid, born from the cross of an OG Kush Autoflowering and a Blueberry Autoflowering, is neither radically Indica nor radically Sativa. However, a clear sign of her dominance is, as her name suggests, her colour. 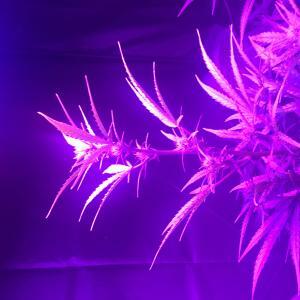 During the flowering, and when the temperature drops by 10ºC at night, Blue Kush Autoflowering acquires some beautiful bluish and purplish hues that are simply magical. Blue Kush Autoflowering offers an average yield of 350-400 g/m2 indoors. If you’re looking for a monster yield, this strain is not meant for you. It’s not that her crops are poor, but her yielding capacity is medium. Is there anything remarkable regarding her yield? The amazing quality of her buds: resin-packed, thick and with an unbeatably intense aroma. These are this plant's greatest qualities. Her taste and scent can be what makes people opt for this strain. Because the marvelous mix of the typically Kush petroleum smell with the fruity touches of her Blueberry predecessor is incredibly exotic. 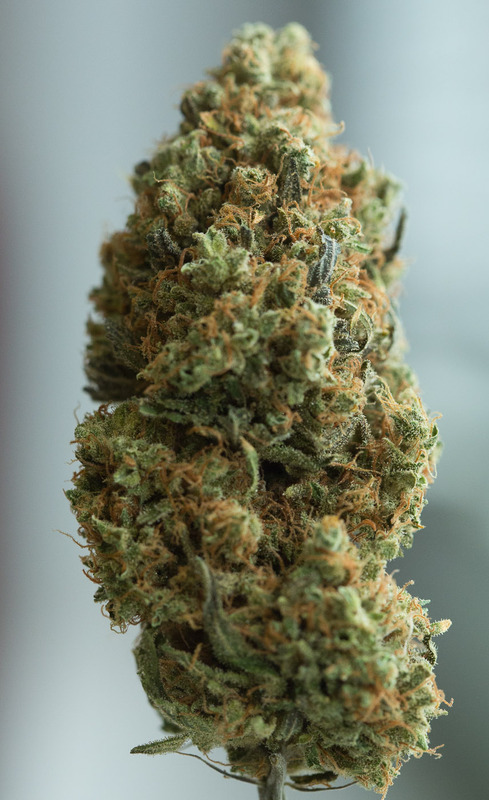 Kush-lovers who wish to make their collection of buds a bit more original and exotic, without missing any diesel notes, will find in these buds a bit of freshness, always staying close to the origins, though. 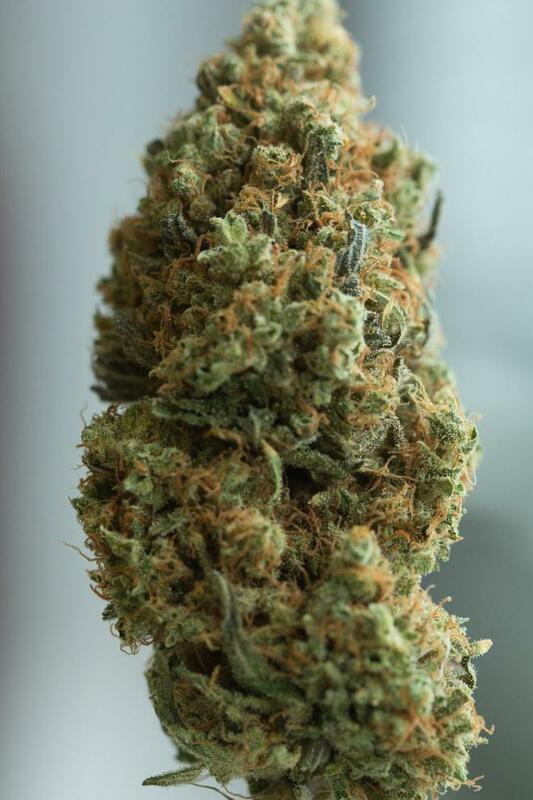 The ‘high’ produced by Blue Kush Autoflowering is not very ‘auto’, that is to say, while autoflowering genetics tend to lack potency, the effect of Blue Kush Autoflowering is very similar to the one delivered by the original Blue Kush. A long-lasting effect of both cerebral and physical sensations capable of alleviating stress and muscle tension. Blue Kush Autoflowering, as most autoflowering plants, is very easy to cultivate. Neither prior experience nor special treatments are necessary to obtain good results. A couple of tips, though: do not overfeed her because excessive amounts of nutrients can do her bad rather than good; and be patient. Wait until day 75 arrives, despite thinking buds seem mature enough before that day. Do not prune at all during her growth either because, due to her short life cycle, you won’t have enough time to shape her well. Blue Kush Autoflowering is a grateful plant that doesn’t need lots of water or food supplements. In fact, we recommend starting with small amounts of water and nutrients, and gradually raise them according to the plant’s needs. Very forgiving, so great for first timers. Great plant that seems to recover very well from mistakes. I recycled part of my coco for this (don't recycle if you don't know 100% what you're doing) and trusted the PPM numbers of runoff instead of my gut, and got it pretty stunted until after 7 days of flowering due to deficiencies. After I upped ferts to "normal" level (50% of what I would use for a non-auto), the plant really came through, very vigorous, healthy and just generally a beautiful plant alltogether. I still have 3 weeks till crop, so I know it will not be even close to my record (auto freebie seed, 1,4g/W with a 250w full spectrum HPS, 60x60x160cm tent) due to my huge mistake with ferts early on, but it's still going to be a nice result (I would guess 100g maximum, unless it really explodes now). VERY strong genetics, can't emphasise that enough. I will return with an edit when I have dried and tried it. This strain was easy to grow, and produced nice fast buds 18" down with 240w full spectrum LED. Be warned though, this lady can grow very tall, and if not careful, will outgrow your tent (if growing indoors and limited for height). Otherwise, very powerful smoke.. I kid you not! Even for experienced smokers..LST her early during veg, if you are limited for vertical space, otherwise just let her grow, and careful on the nutes. One last thing, make sure to use extraction if indoors, as she has a very strong powerful aroma after week 3 and just gets stronger. I would highly recommend this strain, it's a great potent 50/50 hybrid, and does the job well! Almost a QP from one plant! Amazing yield for an autoflowering strain! If you are new to growing, grow this ! This strain is basically awesome, if you are a new grower wanting something easy that yields well (indoors for me) and has a pretty amazing 'high' then this is the one. Have a look at grow diaries, try and find a bad one ! Received as freebie from Attitude last Christmas order. Soft smoke, sweet, at its best it tastes like a blueberry lemon muffin. Lingers on the palate, highly enjoyable. Steady climbing buzz. Time warp, very forgetful. Easy to smoke, will take you one toke over the line. Smelled strong late in flower, fruity, filter recommended. Small box, low watt lights, in Scrog, approximately 5 zs yield. Friends loved it, very social at just a few tokes, feel free to getup and get around. There are stronger strains though, and for these I reserve the fifth star. Did everything it was supposed to flowering at around 28 days, flowered for another 60 and 70 days. Grew well with an average level of nutes. One growth spurt in veg, steady grower in flower. Should be faster with more light! Will grow again! Thank you Dinafem for a wonderful experience on my first grow. Can also recommend for the beginner, the easiest going and fastest of four strains I started. Sold on Dinafem, just opened a pack of White Widow Auto based on how much I enjoyed the Blue Kush Auto. What do you think about Blue Kush Autoflowering?